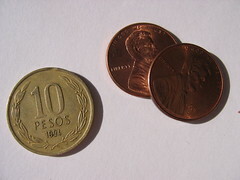 Ten Chilean pesos is worth about two cents. No, literally. In Bolivia, money wasn’t quite so difficult to figure out as in Chile. That’s not because life in Bolivia cost practically nothing—though it did—but because the exchange rate was more easily comprehensible. Eight Bolivianos to the U.S. dollar, easy enough: that $30 Bolivianos steak is going to set you back around $4. In Chile, money is a whole order of magnitude different. This can give you a good scare when you arrive: $100 for an ice cream cone, $200 for the city bus, $1,500 for lunch, and $20,000 for a pair of pants? Of course, since there really are 540 Chilean pesos to the U.S. dollar, it’s best to say “less than” when you use my trick, and recognize that it gets more and more inaccurate as the numbers get larger because we’re pretending there are 500 pesos to the dollar instead of 540. Plus, when Elizabeth visited, she told me it was just easier to divide by 5, so pick what works for you. There are a couple of interesting facts about the currency. Chile recently introduced a new $100 peso coin. Though it is undoubtably better looking, it is not the same shape as the old coin, which means that you cannot use it many places that you might want to (e.g. pay phones). The $2,000 peso bill is a new experimental model; it’s made from plastic, not paper, so it is waterproof, doesn’t crumple, tears less easily (ostensibly), and feels strange. There is also a $20,000 pesos bill, but I don’t come across those very often. In fact, the only ones I have seen have belonged to other people. Hey, you don’t come across $40 every day.